DSI Automotive - Angel-GUARD Inc. Since 1991 Angel-GUARD inc has worked closely with professional rescuers, creative inventors and talented engineers to develop products that are used to save lives, increase public safety, and enable an average person to perform tasks more safely and more easily. The name Angel-GUARD comes from our first product, an infant safety belt that prevented babies from falling off a changing table. We purchased the product from the inventor in the early 1990s and the product name became the company name. The name provided a good umbrella phrase for any safety related item that the company would develop during the coming years. Angel-GUARD now specializes in rescue equipment (used by fire departments and rescue squads, industrial safety products and retail products). 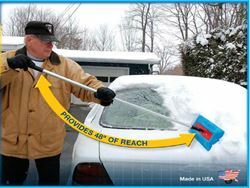 Angel-GUARD manufactures some top-selling and revolutionary products, including the number one selling snow rake in the country, the SnoBrum.